Luke has turned into quite the roller. Starting a week and a half ago Luke was starting to flip from his front to his back consistently. Fast forward to last week and he now has a mode of transportation, the baby roll. Luke will move across the room not by crawling but by rolling over and over again. Moving in such a way he can easily move in one dimension (left and right) but is still hampered and moving forward and backward. Given enough time he can roll and kick enough to switch directions but he usually gets bored, tired, or angry before he completes his three point turn. Just yesterday he was rolling into the kitchen and onto the hard tile. Because his rolls aren't perfect his head still bumps the floor on occasion. However, he didn't seem to mind and enjoyed looking at the light fixtures on the ceiling. Mom's lunch yesterday was also interrupted by having to repeatedly reposition Luke because he would roll himself into a corner. Luke is also making inroads to learning out to crawl. He has the right idea but the execution is all wrong. While laying on his belly he will pick up both his hands and feet and thrash them about while resting on his chest and belly. A turtle on its back would be a good visual reference. He is trying hard but not getting anywhere. 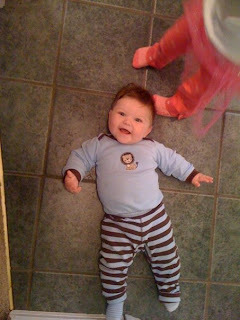 Alyce is doing her best to help teach him how to crawl. She will crawl on the floor while Luke is watching her as an example on how to do it. Alyce is doing this at our request and seems more than willing to help. I guess it is time for Mom and I to start baby proofing for small pieces again. I've forgotten what it is like with babies trying to eat everything.